Identification of immune cells infiltrating the urine during BCG therapy. Flow cytometric analysis of urine-infiltrating cells in urine samples obtained from 28 patients with NMIBC during the 6-week intravesical BCG therapy. Urine samples were obtained before and 4 hours after each BCG instillation. Pre-BCG1 data are not shown due to low urine cell content, which is typical at that time point and does not allow for measurement of immune cell subsets in most patients. (A) Samples were gated on live leukocytes and neutrophils (CD15+), and CD3+ T cells (comprising both CD4+ and CD8+ T cells) were assessed. (B and C) The frequencies (mean ± SEM) of both cell subsets in urine are depicted during the follow-up period. (D) When gating on lineage-negative (i.e., CD3–CD56–CD19–) cells, M-MDSCs were identified as CD15–CD14+CD11b+CD33+HLA-DRlo. 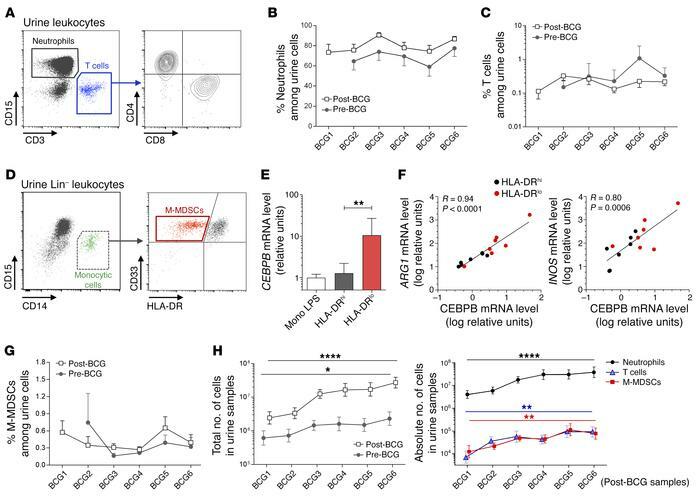 (E and F) Urine Lin–CD14+CD33+HLA-DRlo and their HLA-DRhi counterpart cells were sorted from 7 urine samples, and mRNA levels of CEBPB, ARG1, and INOS were measured relative to the levels detected in circulating LPS-activated monocytes from HDs (n = 3). Levels (mean ± SEM) of CEBPB are shown for the indicated cell subsets (E) and correlated with ARG1 and INOS mRNA levels (F). A 2-tailed, paired Student’s t test was performed to compare both cell populations, and Spearman’s rank correlation coefficients (R) and the corresponding P values are indicated on each panel in F. Lines indicate linear regression. (G) Frequencies (mean ± SEM) of urine M-MDSCs during the follow-up period. (H) Graphs show the mean (± SEM) of total cell numbers in pre- and post-BCG urine samples and absolute numbers of the indicated cells subsets in post-BCG samples. *P < 0.05, **P < 0.01, and ****P < 0.0001, by 1-way ANOVA, followed by a post test for linear trend to assess longitudinal changes.